'The Elms', the Clifford V. Brokaw estate designed by Charles Platt c. 1912 in Glen Cove. 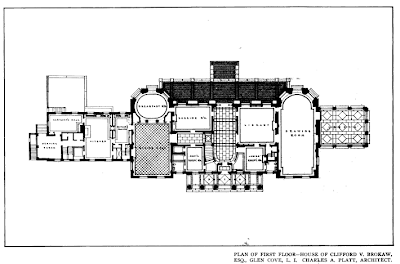 The house has similarities to John T. Pratt's 'Manor House' (also by Charles Platt). Brokaw was a stockbroker who set a record in 1927 when he sold his seat on the NY Stock Exchange for $235,000 (he purchased it in 1918 for less than $60,000). Click HERE to see the farm group to 'The Elms'. 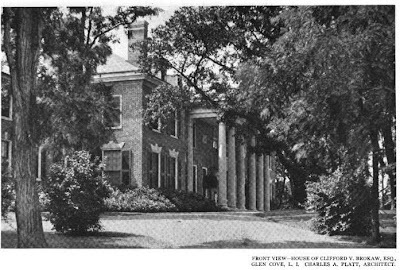 The house was demolished c. 1947. So there is a Long Island "The Elms" as well as the Newport "The Elms." Most interesting. I wonder if any more Marble Houses existed on Long Island. 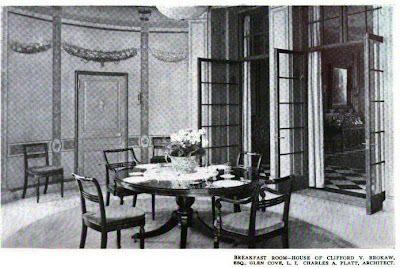 Lovely breakfast room; a bit chilly but lovely.